The STETZERiZER® Microsurge Meter by Graham-Stetzer is designed to separate the power line frequency to detect and respond to low level high frequency voltages caused by transients and harmonics on power lines. The level of these voltages is measured in GS (Graham-Stetzer) units and will vary with electrical equipment and loads. This device is recommended for use in conjunction with original STETZERiZER® filters. 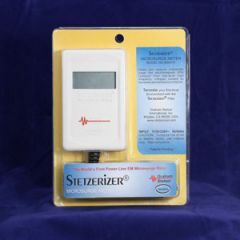 The STETZERiZER® Microsurge Meter was specifically designed as a companion to the STETZERiZER® Filters. 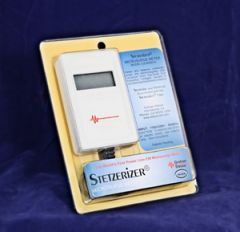 The meter measures the level of harmful electromagnetic "energy" present, and its primary use is to guide effective STETZERiZER® Filter installation. Patents Pending. All Rights Reserved. Works for 60 Hz/120 Volt North American and 50 Hz/240 A.C. Volt European systems. LCD display reads the Volts per second present, which is an approximation for the high frequency energy. High frequencies are the frequencies which are most harmful to equipment, animals, and humans. Is certified by the Government of Kazakhstan as the official means of measuring RF Energy on building wires. Is simple to use — just plug the meter into any standard electrical outlet. Conveniently lists the good, marginal, and undesirable range of meter readings on the back of the Microsurge Meter. Electrosensitive people have reported sensitivities with readings as low as 27 on the Microsurge meter. However, medium or even low Microsurge Meter readings should not be interpreted as a guarantee that there is no harmful health impact; only a medical expert can determine that. Caution is required. Some harmful health effects of high frequency energy on humans appear to be cumulative, and possibly non-reversible. Science is inconclusive in this area, although the body of empirical evidence available for guidance continues to expand and stabilize. The STETZERiZER® Microsurge Meter measures the average magnitude of the voltage surge (i.e. the rate of change of the voltage with time) at the electrical socket. One GS Unit is 24 Volts per second. A human having a low impedance to one of the terminals of the outlet (the grounded wire) and a capacitive coupling of 800 picofarads to wiring connected to the other terminal of the outlet (the hot wire) would have a current flowing through them indicated by the STETZERiZER® Microsurge Meter. The capacitance of two parallel metal plates that are one meter by one meter and separated by one centimeter is about 800 picofarads. The capacitance of a human to the hot wires will usually be less than 800 picofarads and the current through the human will be proportionately lower. The current flow through the human will also depend on how the capacitance of the human to the wire is distributed over the human. This is important since it is the current flowing inside the body, and where it is flowing internally, that determines the effect it will have on the human. The frequency band covered by the STETZERiZER® Microsurge Meter is about 10 kHz to 100 kHz. For complete specifications on the STETZERiZER® Microsurge Meter, see U.S. Patent #6,914,435. Microsurge Meters were specifically designed as a companion to the STETZERiZER® Filters. The meters measure the level of harmful electromagnetic “energy” present, and their primary use is to guide effective filter installation. Microsurge Meters are low-cost, robust, and easy to use by non-technical people. The meters were designed to measure harmonics and other high frequency “energy” present, which are the frequencies most detrimental to human health. The meters effectively ignore the effects of 60 Hz power and other lower, less harmful frequencies. Specifically, the meter measures the average magnitude of the changing voltage as a function of time (dV/dt), which naturally emphasizes transients and other high frequency phenomena that change rapidly with time. The measurements of dV/dt read by the meter are defined as GS (Graham-Stetzer) units (since no standard term is available). The GS units are a measure of “harmful energy” which is a function of frequency, or more generally, rate of change of voltage or dV/dt. Microsurge meters measure the levels of safe, borderline, or dangerous levels of “energy” present. These levels are conveniently shown on the back of the meter for reference. These levels have been developed through research (much of it in Russia and neighboring countries) and confirmed by experience in North America. The levels have been adopted by the Sanitary Stations (Health Departments) of the Republic of Kazakhstan. Starting from points that typically have the highest readings such as the power input panel, computers, and televisions, the meter is used to measure the initial levels of GS energy, and its reduction as filters are added. Once the GS levels are acceptable at one location, the process should be repeated at the next location. After the installation of the filters is complete, a final confirmation of the GS levels should be performed throughout the house.